Minimize the impact of forest fires on the downstream rivers, lakes, and reservoirs with Triton Turbidity Curtain by GEI Works. Wildfire runoff from rainstorms can overwhelm water systems with char, floating debris, and sediment laden water that disrupt and damage the area's ecosystems. 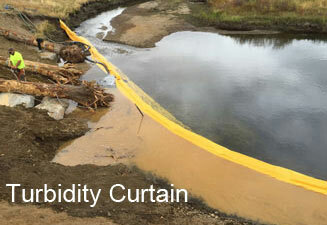 Turbidity curtain (also called turbidity barrier) contains both floating and suspended contaminants. Do you have questions about wildfire runoff? Contact GEI Works at 1-772-646-0597 for answers! Designed for use in calm water areas with little to no current. Triton Type 1 Turbidity Curtain* is available in several styles, including: Economy Grade, DOT Grade, Contractor Grade, and Geo Curtain. Built specifically for conditions with moving water, currents (up to 1 knot) or tides, waves up to two feet, moderate wind. Triton Type 2 Turbidity Curtain* is available in DOT grade, HD ((Heavy Duty) Grade, Geo Curtain, and Permeable Grade floating barrier models. Made to withstand rigorous conditions, Triton Type 3 Turbidity Curtain* are designed to provide reliable turbidity protection in fast water (up to 1.5 knots), waves, and demanding conditions. They are available in DOT grade (permeable), HD (Heavy Duty) grade, and HD DOT grade. See our Triton Turbidity Barrier Comparison Chart for more details. *Custom solutions are also available. Since GEI Works is the turbidity barrier manufacturer, we can easily and affordably accommodate any specific requirements you may have for your project. Call us or fill out a request form, and we can help you decide the appropriate style, model, and installation plan for your location. Our knowledgeable staff and engineers are available to assist you. In its simplest terms, turbidity can be defined as suspended particles that affect water clarity. Turbidity is measured by how many sediment and pollutant particles are contained within a water sample. The heavier the concentration of particles, the bigger the impact the turbidity has on the environment. Heavily turbid waters not only impact water quality for human use and consumption, but also contribute to algae blooms and fish-kill, along with damaging other aquatic life. Turbidity curtain is most effective when placed strategically and installed per manufacturer recommendations. Curtain placement is key in ensuring that a sufficient containment area is created that allows appropriate settling time for suspended particles. The suggested curtain depth is (installed) within no less than 1 foot of the watershed's floor. Proper anchoring (on-land and in-water) will also determine the success of your project and protect your turbidity barrier for long-term use. See the Triton Turbidity Curtain Installation Instructions for more information. In some circumstances, the water pollutants are not suspended beneath (or within) the water, but instead are floating on the surface. In these cases, Floating Debris Barrier (also known as Debris Boom), manufactured by and for sale by GEI Works, is the answer. 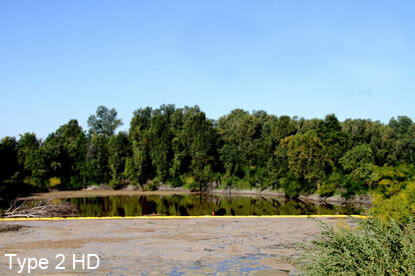 It will create a containment area for floating contaminants and debris, and prevent them from moving downstream. Do you have questions about the impact of forest fire? Contact GEI Works at 1-772-646-0597 for answers!